Virtusa Corporation, Platinum Partner with Pegasystems, announces the Head Start Program for engineering colleges to improve the readiness of students in BPM Technology with the aegis of Pegasystems before entering into Corporate. Vishnu Institute of Technology is one of the five Premier Institutions in the world which is awarded with Virtusa - "Center of Excellence" & is the first college which inaugurated the center of excellence. The center of excellence was inaugurated by Sri R Sowmya Narayan, Vice-President (Pega Practice), Virtusa Corporation. He explained how all over the globe the Pega experts are numbered around 6000, and our students would be joining this elite group. It is one of the best starts for any career in IT industry because the demand for PEGA expert is going to be very high throughout the next decade. They may also get the onsite job opportunities much earlier than other students working in usual domains. He also congratulated the selected students and the Department for being a part of this one in a kind training program. Mr. R. Srinivasa Raju and Mr. S. Adinarayana, who had undergone a three month long PEGA training in Virtusa Hyderabad and had also been instrumental in developing the course contents for the upcoming training modules, were also thanked by the Vice President Sri Sowmya Narayan for their continued efforts in shaping up this center of excellence. A value addition program "Training on BPM & PEGA Tool" is being introduced to IV B.Tech students (who are selected by Virtusa in campus recruitment) in association with Virtusa Corporation which improves the readiness of the students when they join industry. The course is supplemented by practicals using PEGA tool. This is a unique program available in very few colleges across the nation, where the students can develop applications in less time. Students will be trained through both In-house and External training programmes, workshops and extracurricular schemes. A completely industry relevant Big Data Analytics training and a great blend of analytics and technology, making it quite apt for aspirants who want to develop Big Data Analytics skills and head-start in Big Data! Smart representations (such as embeddings, graphical models, discretizations) are useful models that allow the abstraction of data within a well-defined mathematical formalism. The representations we aim at are conceptual abstractions of real world phenomena (such as sensor reading, causal dependencies, social interactions) into the world of statistics and discrete mathematics in such a way that the powerful tools developed in those areas are available for complex analyses in a simple and elegant manner. 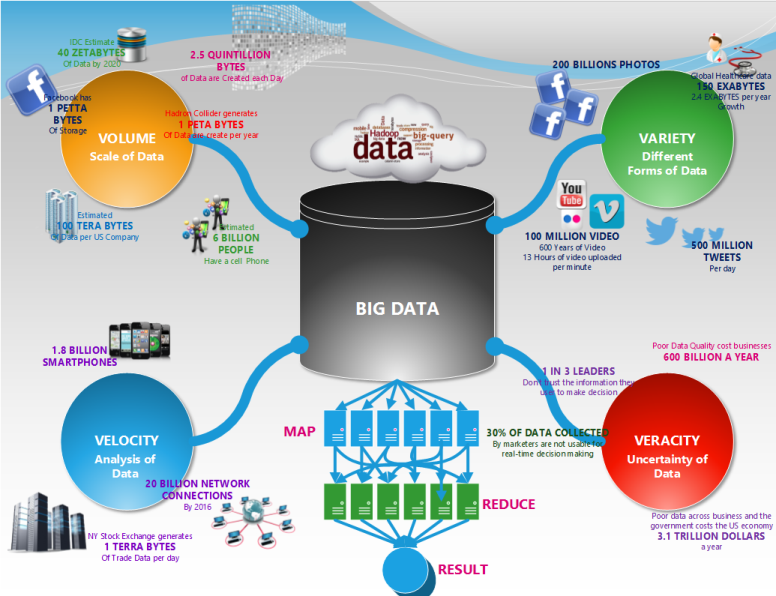 Big Data Lab is established with 20 Systems. We made Hadoop Cluster with these 20 Systems. Here we are giving training for more than 30 students every year on Big Data tools apart from curriculum. We are also working on Apache Spark as well. Student training is on Hadoop Administrator or Developer. Administrator training is configuring Big Data tools Hadoop, Spark, Pig, Hive.. etc. Developer training on some tools MapReduce, Spark using Scala, Pig Latin Script, Hive database, MongoDB etc. Our faculty are also moving into Big data rapidly by attending workshops and using Moocs. They started doing reasearch on Big data and data science. The Assistive Technology Lab (ATL) in Vishnu Institute of Technology,Bhimavaram,West Godavari District, Andhra Pradesh which is in collaboration with UMass, Lowell is a part of Sri Vishnu Educational Society and is a vision of Mr. K. V. Vishnu Raju, the Chairman of SVES, to utilize the skills of every engineering department of the college for the development of Assistive Technology. During his visit to many universities in the United States, one thing that ignited his mind was the Assistive Technology Program at University of Massachusetts, Lowell. Assitive Technology Lab in VIT is thus a result of his progressive thinking, which paved the way for a MOU between the University of Massachusetts and VIT. He initiated the program by inviting Professor Alan Rux, founder of the Assistive Technology Program at the University of Massachusetts, Lowell, USA to VIT. Assistive Technology Lab was successfully established in the year 2012 at Vishnu Institute of Technology.ATL works for a very unique and a noble cause of designing projects by the students of VIT to benefit the differently-abled. This is small but a definite step to mainstream people with disabilities into society. Assistive Technology Lab at VIT is setup in a very peaceful and ambient atmosphere with high end personal computers with Internet connectivity and sophisticated electronic components like CRO, RPS, micro-controllers and also imported electronic components that are unavailable in India, thus ensuring high productivity. According to Prof. Alan Rux, engineering students all over the world should be encouraged to undertake various projects in the field of Assistive Technology and make its impact felt. Conducting Bridge course nearly for a month on different subjects related to ATL (EDC, MPMC, STLD, Electrical Machines, Embedded C, Testing and Development Tools, Analog Discovery kit). Design, implementation and testing of the prototype model. Donated to the clients on Dec-3rd of every year. ATL is running from 5-00 pm to 9-00 pm. During the peak time of the projects we stay late nights also. E-coat, E-slate, Liquid Level Identifier, Braille Script Reader, Human body parts Identifier, Smart knowledge pad, Talking calculator, RFID based object identifier, Hand Gesture reorganization, Talking box, Braille Table Trainer, Automatic dropped object identifier, Braille keypad with voice, Barcode Reader, Home appliance control, Audio player for visually challenged, E Braille Trainee device, Multipurpose Braille E-type writer Head, Wireless Hand Gesture Recognition, Voice recorder and playback, for visually challenged, Multipurpose E- Jacket, Student alert system for Hearing impaired, Colour detector for visually challenged, Multi directional Obstacle Detection for visually challenged, PC key board learner for visually challenged, Speech display for hearing impaired, RFID based location identification, Talking calculator, Talking Alarm, Countries information chart, Fruits identifier, Easy learning of Braille, Object identifier, SD card based voice recorder and play back system, Heart functionality demonstration system, Head movement wheel chair, Medicine dispenser for elderly people. Liquid Level Identifier: A compact product named as Liquid Level Identifier which helps visually impaired people to know the liquid level while pouring into a cup. RFID object identifier helps visually Impaired people to live well and independently, and also useful for normal people to identify the objects. Colour detector for the visually challenged. Hand Gesture Recognition: The aim of hand gesture recognition system is to create hand gestures as the basic communication for both paralytic and speech deprived people. Talking Box: The main theme of the project is to give support to the duff and dumb people to express their needs to the common people through this device. Countries information chart: It is used as a teaching for hearing impaired .different countries information like population , currency, currency in rupees, capital of the country. Medicine dispenser for Elderly people: Main objective is to dispense the medicines to the elderly people according to their timings and also sends the alert message when the tablets are over. Home appliance control: Objective of this project is to control the home appliances through remote control. E-slate: The main objective of this project is to learn the alphabets by writing on the E-Slate, in these alphabets are displayed on the E-Slate by pressing the up and down buttons. Human Body Parts Identifier: The main objective of this project is to learn the functionality of the different parts of the human body by pressing different buttons, located at various positions. Smart Knowledge pad: The main aim of this project is to make the visually challenged students, a step forward in their education. They can select the topic and can hear the respective basic information. Braille Script Reader: The Braille script Reader helps the visually challenged people to read Braille script printed on the normal Paper by the laser printer. This project converts Black dots on the Paper into Voice output. Easy Learning of Braille: This is a Teaching aid for visually challenged people to learn the Braille language easily without the help of others. Talking calculator: People who are visually disabled are not disabled but are definitely able as they can learn and study at the same benchmark standard as the normal student does. E-coat: This E-Coat helps the visually challenged people to identify the obstacles in front of them and it gives the alert in the form of vibration and voice. In the present conceptual age, the growth starved organizations are looking for creative and innovative talent over and above the conventional traditional qualifications. Innovation lab helps in developing creative mind-sets and leaders so that they students can convert challenges into opportunities, constraints into advantages, chaos into order and ideas into wealth. The students also master the art of generating breakthrough ideas and transform evolutionary ideas into revolutionary innovations. The additional skills of creative leadership and innovation training acquired by the students helps in attracting the most innovative organizations and MNCs to the university for picking up the innovative talent creative students with new ideas. Our Innovation labs are based on the concept of 'Intelligence having fun'. The tools provided are based on gamification of ideation. The students love the WOW experience of the innovation labs and are inspired to create new products and services. Innovation lab is the new playground to create new breakthroughs. Our innovation labs provide the enriching experience to the Student and provides them the opportunity to break away from the monotony to create novel ideas. Our innovation labs are the best enablers of start-up culture. Help the students in connecting their innovative ideas with our vast network of corporate customers, technology providers, industry associations and innovative solution providers. We also connect the students to large organizations with open innovation networks for better career opportunities. The National Instruments (NI), a Centre of Excellence has been started by Department of Electronics and Communication Engineering under the aegis of Vishnu Institute of Technology, Bhimavaram in collaboration with National Instruments (NI). This centre was inaugurated on November 23rd, 2017 by our respected Chairman Shri. K. V. Vishnu Raju Garu. The NI LabVIEW (Laboratory Virtual Instrumentation Engineering Workbench) Academy was initiated to establish connections and communication between different departments to create interdisciplinary specializations. The centre aims at interdisciplinary research programs, scientific research projects, research relationships with other research centre's or distinguished researchers in collaboration with industry. The course structure is framed such that it comprises of LabVIEW Core-1 and LabVIEW Core-2 courses. The entire course is to be conducted for the duration of 3 Years. The LabVIEW courses is planned to start when a student enters in the II Year of his/her B. Tech curriculum. The Table below provides the details of the course that would be dealt in the three years. Enhances the student skills to solve real-time problems, develop prototype models related to applications like - Automotive, Bio-medical, Engineering, Robotics, Metallurgy, Mechanical & Production Engineering, Power Systems, Process Control Design, Remote Sensing, Telecommunications, Industrial Automation, Image Processing, Aerospace and Military. The Vehicle Technology Laboratory is a centre of excellence in the Department of Mechanical Engineering. We provide engine working models and cut models to give practical exposure about the concepts of automobile systems like transmission, suspension, power- train, steering, and chassis design etc. Students also learn the Disassembling & Assembling of different automobile engines and study each part of the engine. Through this lab students will develop a deeper understanding about the automobiles and the skills required to work in the automobile industries. The students are also trained to design and fabricate go-kart vehicles and environmental friendly bikes to participate in various competitions. The vision of establishing this lab is to provide hands-on experience to our students. In this lab students are trained to use computers for drafting, modelling and analysis of a product, these facilities are provided for making real time projects. This lab is equipped with 72 systems and operating on 11KVA UPS. This lab is a unique platform to learn modelling and simulation softwares for the students. By using this lab, students will be able to create, modify, analyze or optimization of a design and also enhance the quality of the design. 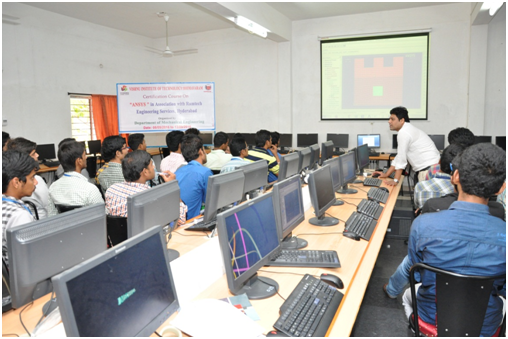 During semester breake in summer students are trained on modelling softwares like AUTO CAD, CATIA, SOLID WORKS etc. and are also trained on simulation softwares like ANSYS. This lab is useful to the students to participate in various design competitions. We are conducting design workshops in association with the Ramtech Engineering Services, Andhra Pradesh State Skill Development Corporation to enhance the knowledge of students to meet the industrial requirements. In this Lab, students are trained to use the licensed Mechanical Engineering softwares like EDGECAM, FLEXSIM and SOLIDWORKS etc. Apart from the modelling and simulation softwares, students are able to operate computer numerical controlled (CNC) machines which include CNC Lathe, Milling machines. Student will also get a brief idea about the Flexible Manufacturing System (FMS) which is widely used in manufacturing industries for material handling purpose, with the use of ARISTO 6 AXIS ROBOT along with Automated Guided Vehicle (AGV) system.